We're enjoying lots of outdoor pickleball this summer in beautiful upstate NY and played in the Empire State Games in June. Last weekend, Fred and I played in the 2nd annual Rochester Picklefest, which was a USAPA sanctioned tournament this year with over 90 participants. We even had one junior player who came all the way from Myrtle Beach! It was a great turn-out and it's hard to believe that two summers ago when we wanted to play here, we only knew 4 other pickleballers. Thanks to the USAPA website, people found us. Then we got connected with even more folks on the other side of the City, thanks to our two local ambassadors, Dave Thomas and Linda Palma. We now have over 250 active players on the Rochester email distribution list. 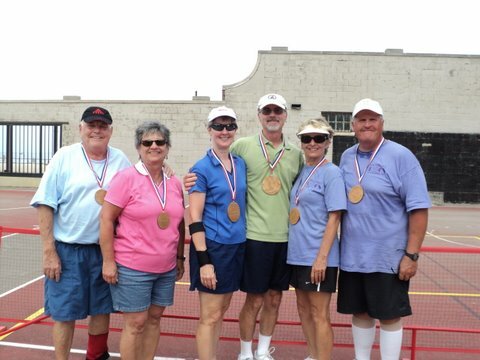 A clean sweep for USAPA members, capturing all three mixed doubles medals at the Rochester Picklefest! Left to right, Phil and Bonnie Coburn, bronze; Jane and Fred Harvey, gold; Wendy Cooper and local ambassador Dave Thomas, silver. When I asked Dave Thomas, if there would be a membership booth at the Picklefest, he said, "Yes, you're in charge!" So I let everyone know they'd have an opportunity to join the USAPA at the tournament, gave them information about the benefits of joining, and suggested they bring their checkbooks. I also offered to pay the postage for their applications and gave out free mini pickleball key chains to new members. Twenty-one people signed up! We now have 53 members locally, which represents over 20% of our group. Soon, the email roster will feature bold blue USAPA letters after their names, which I hope will generate more interest. The National Senior Games are coming to Rochester again in September. This year, they will be played at a world class venue. The publicity will be wonderful!